You might not have seen very many of my relatives around because French Spaniels or Epagneul Francais are not yet well known outside of France. There are a couple of interesting theories about how my breed was developed, but I�m not sure that anybody knows for certain what our true heritage is. It doesn�t really matter to me. What matters is that I am very popular in France and I am a fine hunter and companion. 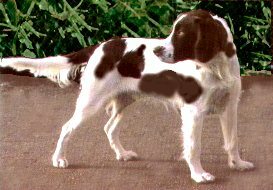 My coat is white with liver markings. When fully grown, I am between 21 and 24 inches tall (53.3 to 61 centimeters) and I weigh between 44 and 55 pounds (19.8 to 24.8 kilograms). We have no French Spaniel Breeders listed at this time. Click here to place your French Spaniel Ad!